Christmas is my time to savor. Every day offers the chance to savor God’s best when we are looking for it but winter slows me down to find it. As the snow falls my heart grows quiet and I am able to see and enjoy things I am often too busy to notice in the Summertime. Each season has a purpose and for me winter is for savoring all that is placed directly in front of me. The comfort of a mug of hot coffee. The feeling of a warm, knitted blanket wrapped securely around me. A book to enjoy, the art of a story put before me, each page filled with the words that will bring each character to life. Music playing loud enough for my kids to dance to but quiet enough for me to hear them sing. Simple togetherness when we are snowed in and have nothing better to do than snuggle on the couch and watch a Christmas movie together. These are all gifts God has given that I can choose to receive each day or cast aside in a pile of things I “don’t need”. I’m so glad I serve a God that wants good things for me! It doesn’t mean everything is in my life is perfect, but that God gives us good in the midst of the imperfect. Even if you are in your very worst place, God is putting good things before you each day, you can either receive or reject the gifts put before you. As a mother I have a strong desire to put good things before my kids and hope they choose to receive them: freshly baked cookies, a blissful afternoon sledding in the snow, joyous songs played on the piano, a favorite meal on a rough day, or a good story read by moms familiar voice. If they were to cast aside these simple gifts my heart would be sad for them to miss out on the goodness put before them. There’s been a recent trend among Christians over the last few years to put a huge emphasis on gratitude in our kids. Now of course who of us doesn’t want to have thankful children? I know I do! Sometimes to make a point, we over shoot, completely missing the mark & send our arrows drifting pointlessly without a target. In an effort to teach gratefulness, we are often taking good gifts we could put before them, therefore losing some of the best ways we can teach this character quality which is so close to the heart of God. My parents never spoiled me or my siblings, however at Christmastime it was a time my parents would bestow some specially chosen gifts on us. Myself being the oldest of six brothers and sisters having my parents choose something specially for me became so important for my heart as a child of theirs. I did not physically need the gift they gave me, but perhaps my heart needed the affirmation that they would take their resources and bless me with the perfect present each year. Not once did that gift having me feeling more, more, more! But it left me with the feeling of contentment and security in their love. Isn’t that how we feel when God gives us those small and wondrous gifts when we are open to receive them? We feel specially chosen, thought of and want other people to feel it too. Is there any better way to get your children thinking of others, than putting them in the shoes or perspective of another? This allows them to truly feel what the character in the story needs, thinks or feels. Reading The Hundred Dresses taught my daughter more about how to feel empathetic towards a person who has less than her and consider how it feels to be teased by others or defend those who need encouragement. Pick up a biography of a Christian missionary like George Muller who kept giving more so they could care for the orphans who needed even more. Or The Family Under The Bridge, about a family whose Christmas wish is to simply have a home of their own. Little House In The Big Woods is perfect just for remembering the good ole’ days when Laura was perfectly thrilled to get a doll and a pair of mittens for Christmas! If you care deeply about needs of those around the world, engage your kids in what is going on around the world. Don’t be afraid to share hard things with them if you know it will stir a desire in them to be gracious to those needs around the world. 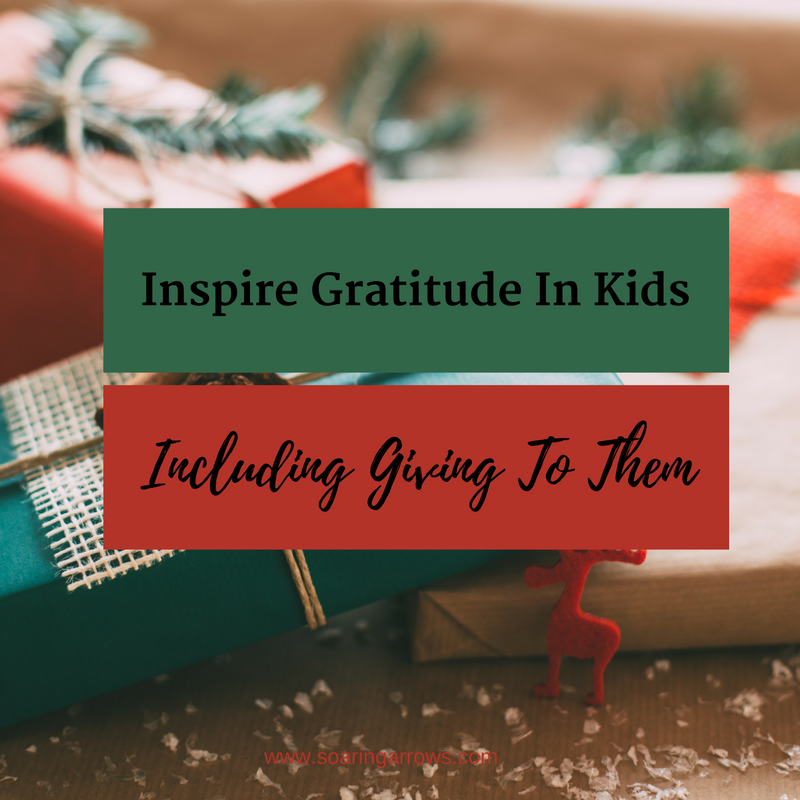 Curling up on the couch to enjoy these stories and have a conversation about them will stir up big feelings of gratitude in your kids as well as questions about how they can help those in need. Help them realize they can be the hero of someone else’s story and they will feel grateful for their own story. As parents it can become a habit to just take care of things. Right? It’s easier to just pay to sponsor that child than to count my kids dimes and pennies. But when given the chance to partake in the giving my heart is always bursting with joy at my kids willingness to give. They not only freely part with nearly all the money they have but are also asking if there are extra things they can do to earn more money to give. If I just handle all the giving I am never giving them the chance to feel that light hearted feeling when you bless another. Even if their giving is small it is setting them up for big giving in the future and I want them to know that even a small kindness can go a long way. That is a contagious feeling I want them to not only feel but I want them to keeping feeling it. If you serve by delivering meals to families, you can have your kids contribute by putting together a batch of brownies if they are old enough! If you serve in church nursery, see if your kids can lend a helping hand alongside you. This week we were thrilled to play a small part in planning a funeral meal for a family in our neighborhood who had lost a loved one. Our contribution wasn’t a large one but it added up to having the entire meal planned for this family. I made sure to tell my kids as another neighbor would step up to lend a hand and each meal item was checked of the list. They were so excited when I told them the last thing had been taken care of! I could have just delivered the pies and said nothing to my little ones, but I wanted them to see how God would take care of this family one thing at a time. I do save this gift giving to be done only on birthdays and Christmas. If we are always giving to our kids it will become numbing to them. Before you know it you do have a child who isn’t grateful for much because it’s hard to see the gifts through the clutter. Reserving the gift giving for special occasions keeps it special. Now that some of our kids are older they really only want one special thing and you’d better believe I’ll be making sure those are the gifts they will open on Christmas morning! When you know what it is to receive such a specially chosen gift, isn’t the next thing you want to do to get another feeling the same? Random strangers have paid for my food in the drive through when we couldn’t afford it, or quietly hand me $10 at the grocery store to buy my kids ice cream. I will never forget those gifts which God had perfectly orchestrated when I most especially needed to feel His love wrap around me and will always be looking for ways to pass small kindness along. When my kids see I am deeply thankful for all gifts large and small, I am setting the standard for gratitude in our family! Because we are children of God! And inspire gratefulness in them. We have always included our kids in the gift giving process, doing things that would fit for the age they were at. Some years they have made gifts, saved to buy their own small gifts for others, or we have pitched in to help. Any way you slice it, I have been so thrilled to see how much my children have enjoyed not only getting, but in giving gifts. My kids love to serve the elderly at Christmas. They are always thankful for the gifts they receive, but maybe it’s because they haven’t done a lot of TV watching, so they haven’t been exposed to so many commercials that endorse greed. Susan what an excellent point! We only watch shows streaming now so commercials are totally unfamiliar to my kids as well. They don’t know what the cool toys are!